John Samiotis, the owner of Samiotis Tours, greeted them with a smile. A magical day excursion unfolded. Yanni, the tour guide kept them entertained in Greek with his colorful personality, aided by his wife Varvara (Barbara). Tour 2 left at 10 a.m. and returned at 7 p.m. for the price of 30 euros. Their itinerary was Agiasos, Panagia Agiasou, Karini, Plomari, Agios Isidoros, Perama Bay of Geras. Susan, with the help of Despina’s Greek translation, enjoyed the warmth of the Greek people. Mytilene’s Statue of Liberty welcomes all at the harbor entrance. Fishing boats, cars and motorcycles dotted the picturesque coastline. “Mytilene is a great sophisticated island with many olive trees,” said Susan. Tour guide Yanni explained that “there are over ten million olive trees. We are the #1 producer of olives, more than Cyprus. Mytilene is the third largest island in Greece. Crete is three times larger and has ten million olive trees.” Studies show that olives and olive oil lower levels of bad cholesterol. The Mediterranean diet is well known. Plomari, the major ouzo producer of Greece, was their first stop on the way to the beach resort of Agios Isidoros. They saw the old and modern distillation mechanisms for ouzo. “Five generations of the Barbayannis family produce ouzo,” said Susan. According to the Barbyannis website, “the picturesque settlement of Plomari, Lesvos technology harmoniously co-exists with history and tradition.” The tourists were amazed by the century old black and white framed photos. Some photos included: “Popular Festival at the Country side of Plomarion in the end of the 19th century”; “A cafenio customers at Plomari in the 1900’s”, “Ouzo Barbayanni: The Tresure of Plomari” and others. “Barbayanni ouzo began in 1860,” explained Despina. “The best ouzo is Aphrodite. I was impressed with the front page of the newspaper “Laikos Agon” that was framed. The headline was ‘Long Live the Liberation of Mytilene’. The second headline is ‘Long Live Venizelos, November 10, 1912. Long live the Planter of Hellenism, Eleftherios Venizelos.’ They just love Venizelos on this island.” It is now one hundred years since the liberation of Mytilene from the Ottoman Empire during the Balkan Wars. The 1912 wars brought the northern Aegean islands into Greece. Along the road, they saw posters of the Eleni Paparizou Concert in Mytilene Fortress. “All over our destination, singers such as Alexiou, Glykeria, Plutarchos and others were having major concerts,” said the tourists. A visit to Agios Isidoros was their next destination. The famous beaches of Mytilene with hotels dot the coastline. “The beach has pebbles like our beach in Mattituck, Long Island,” observed Despina. 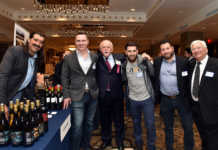 Many have compared the North Fork of New York’s Long Island to the coast of the Aegean islands. Susan, a fourth generation American, marveled that “there is no sand on the beaches. But, there is a lifeguard. The sea is blue.” Everyone has their own perception of Greece’s beaches. Agios Isidoros Beach has a “Good Behavior Code” poster. “The Blue Flag has been awarded to our beach, because it follows the conditions of the European Program,” said a beach poster. “Clean Sea. Clear. Care for the environment.” Islanders are modern in their ideas. The Bay of Geras is known for its fishing with the village of Perama on the coastline. They stopped at an Agiasos Taverna advertising traditional foods with homemade yogurt and rice pudding. They enjoyed kolokithakia (small stuffed zucchinis), mpourekakia (fried ham with cheese) and Mytilene kolokithoanthi (stuffed zucchini flowers https://easy.betterrecipes.com/stuffed-baked-zucchini-flowers-yemistoi-kolokythoanthoi-sto-fourno.html). A wide array of traditional vegetable and cheese dishes were offered at reasonable prices. The taverna looked like a postcard: square tables with white tablecloths, blue country chairs, and canopy of grape vines surrounded by Mediterranean vegetation. A shaggy dog gave them a thoughtful glance. “Agiasos is known for its wood carvings, ceramics and Church of Panagia Agiasos,” said Despina. 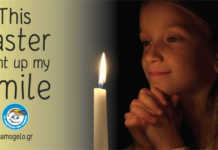 “The church is known for its wood carved chandeliers and intricate woodwork. A wall inscription describes the role of emperor Valerios in the creation of Panagia Agiotisa.” In 1170, Constantinos Valerios granted the monks of Karya permission to erect the Church of Panayia on the elevation where the holy relics of the monk Agathon lay. The monk brought the icon of Panayia (Our Lady) that was painted by Luke the Evangelist, from Jerusalem. The Church was rebuilt three times. The tourists visited ceramics and wood carvings shops. They enjoyed seeing a cheese shop selling ladotyri. It is a unique cheese product made only in the island of Lesvos. The cheese is preserved in olive oil and produced since ancient times. 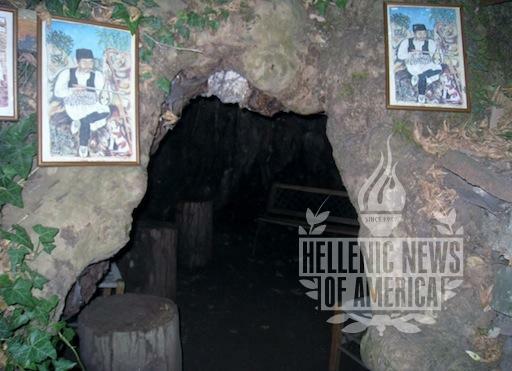 “We stopped by the home of Theophilos Chatzimichael in Karini,” explained both tourists. 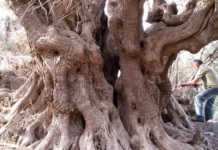 “Theophilos lived in the cave of a giant tree. His paintings are on the walls of the local taverna. A picturesque fountain, bridge and ducks are nearby.” Theophilos drew the themes for his paintings from the traditional life, mythology and folklore. He painted in coffee shops, houses, churches for a plate of food. He died in extreme poverty of food poisoning. 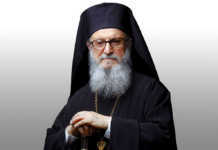 Theophilos was honoured for his work after death. A museum of his works is in Varia, a suburb of Mytilene. They enjoyed frappes and ravani at the local taverna with Theophilos’ paintings. A nature trail was nearby. Sunrise Tours of Chios gave them excellent advice, leading them to this magical day in Mytilene at a budget price. 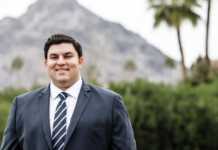 Mr. John Samiotis welcomed the American tourists with warmth and genuine friendship. “Despina, give your mother this book on Mytilene,” he said. “The book ‘Lesvos, Nature, Traditions, culture and People’, published by the Nomarchia (Province) of Lesvos, will give her an insight in our island. This is the reality of travel in Greece. When one wants to escape and gain a positive outlook, go too Greece, the land that welcomes all travellers. 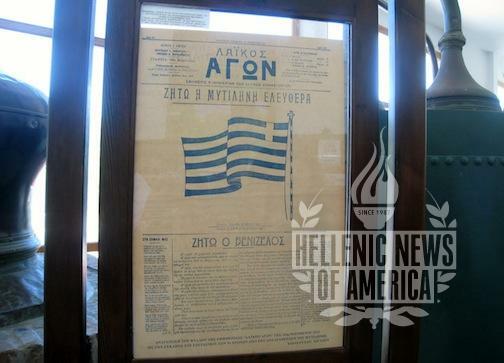 Photo1- 1912 Liberation of Mytilene newspaper. Photos by Susan Atzchiger and Despina Siolas, Md./Ph.D. 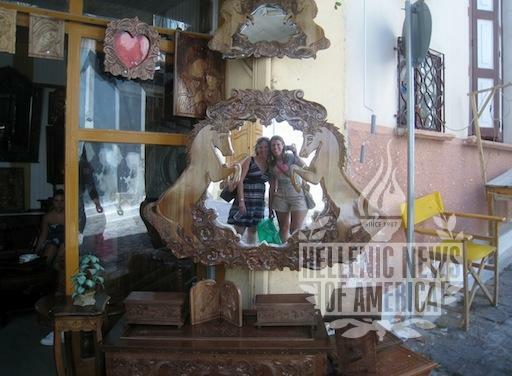 Photo 2- Tourists visit Wood shop, Agiasos.